If you are in London this winter don't miss the amazing festive displays: stores windows turn the high streets into spectacular wonderlands, a magic event that each Christmas brings thousands of tourists to the Capital. This year iconic luxury department store Harrods has been inspired by the classic British steam train and added a lot of glamour to it. The impressive Christmas window installation is made up of carriages, each showcasing the store’s much sought-after festive fashion, accessories and homewares. It took a team of 50 people over 500 hours during three weeks to create the Harrods express. The team was led by Store Image Director Mark Briggs and Head of Window Design Sarah Southgate. Apart from designer evening gowns, luxurious jewellery and bespoke children's toys, the amazing display features 60 huge Christmas trees and the most expensive item in the store, and incredibly glistening £80,000 Swarovski-covered dress by Ralph & Russo. Harrods Department Store: 87-135 Brompton Rd, London SW1X 7XL. Closer metro: Knightsbridge, Piccadilly line – zone 1. Open Monday – Saturday, from 10 am to 8 pm, and Sunday from 11.30 am to 6 pm. At Selfridges, in Oxford street, the Christmas window display this year includes edible 'Lost London' Fantasy Cityscape made of gingerbread, snowmen playing in the snow and a host of oversized Christmas gifts. 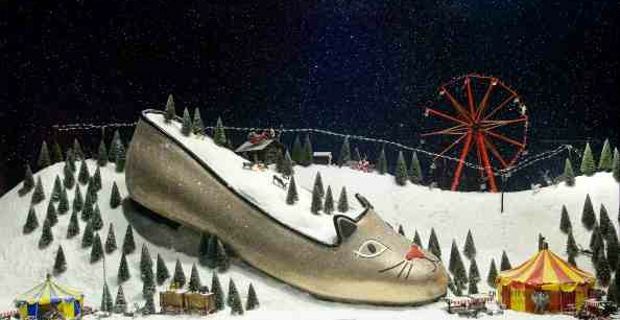 Themed around the idea of Gulliver's travels, the extraordinary celebration display remarkably features giant versions of a Charlotte Olympia shoe, Beats headphones, Kenzo sweater, Play-Doh pot, and Nike sneaker. Each one of the wonderfully oversized objects are presented as the perfect gifts, set in snowy landscapes populated by Lilliputian’ communities. The edible vision of London's lost architecture displayed at Oxford Street was realised by food pioneers Bompas and Parras. They create the magical gingerbread display bringing together long-gone landmarks and un-built features. The amazing work took more than 400 hours to complete. Selfridges: 400 Oxford St, London W1A 1AB. Closer metro: Bond Street, Central and Jubilee lines – 1one 1. Open Monday- Saturday from 9.30 am to 9 pm, Sunday from 11.30 am to 6 pm.